Perhaps the most frequently repeated words in a growing designer’s lexicon, and for good reason; any designer, creative, or creative agency must first create actual content in order to solidify their legitimacy, let alone proficiency, in their craft to the rest of the world. The importance of production has become so ingrained as a creative standard that it might as well be part of any designer’s mantra. When freelancers and firms both compete for attention in roughly the same spaces, the necessity of publishing content online — of purchasing a domain and setting up a website, preparing case studies and showcasing expertise, and building a social presence to stay connected — might as well be do or die. We see production’s level of importance holding true within the networking sphere. For instance, winning the floor and earning trust from clients is critical, even mandatory, during the introductory phase. Having all the nuts and bolts, all the wheels turning properly within a company’s infrastructure, exudes professionalism and capability. When the gears are running smoothly on one end, the other end responds well—the result is clear communication and earned trust during face-to-face interaction. Establishing credibility upfront as a business offering true value to clients is imperative to moving forward, laying down the strong foundation for a promising business relationship. Without a doubt, production is a central focus for anyone working in a creative field. Producing creates practice, which in turn leads to a higher degree of content quality and experience. As practice and production become habit, the correlation between practice and production becomes essential for success. No matter who you are or how successful you are at your craft, absorbing inspiration is just as important as producing new content. For athletes, the acts of producing and absorbing are inherently integrated. 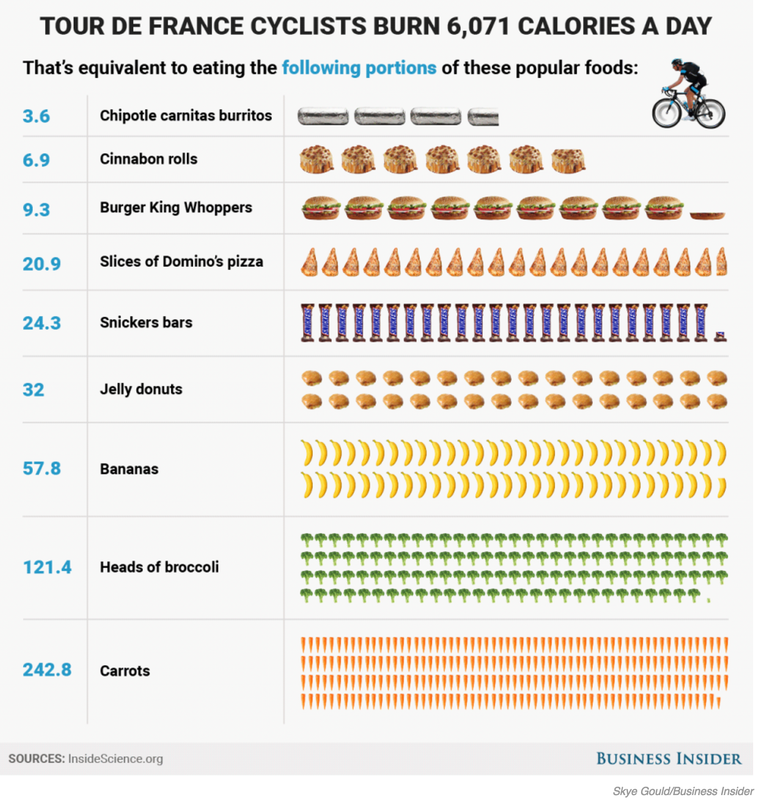 Throughout a single day during the Tour de France, a professional cyclist consumes over 6,000 calories (Business Insider created a rather humorous diagram illustrating just how much of which types of popular foods you would have to eat to reach this calorie count). It goes without saying that riders who don’t consume all the calories they need during the day won’t be able to finish a stage. Each stage is roughly 110 miles! Along the same line, you wouldn’t expect your car to drive any reasonable distance without first filling the tank with gas, or your sailboat to conquer the sea without any semblance of wind or current. These ideas seem absurd. That’s because they are. By now I’m sure that you know what I’m driving at. Nothing is produced in the creative sphere that isn’t first fueled by something else, no matter how spontaneous or random the act of production. For freelancers and agencies alike, that is translation for producing lackluster material; any kind of work without adequate inspiration is likely to result in a final product that is lacking both substance and intrigue. That doesn’t mean creatives need to consume 6,000 calories per day in order to be successful, but that the act of consuming inspirational material is central to the performance of anyone who considers their profession a creative endeavor. Since the default working state of creatives and designers is not likely on a bike, inspirational material will vary according to the individual. 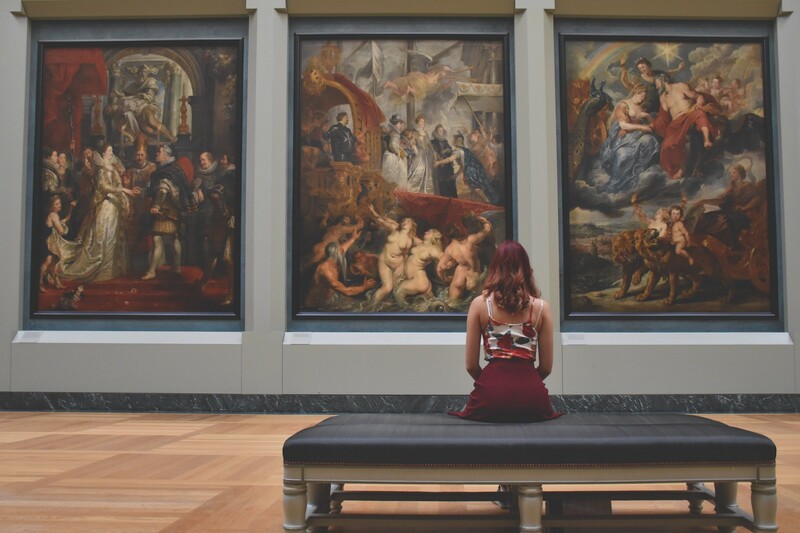 Some people may be inspired by browsing Pinterest, reading books and magazines, or by watching Ted Talks, while others may gain innovative ideas and pleasure from traveling, attending conferences, or exploring art galleries and museums. In my opinion, it’s the latter category of inspirational material that cannot be overlooked. In comparison to scrolling passively through creative websites or flicking through the newest version of Communication Arts, actively experiencing in both mind and body creates a far greater impact in cognition. Not to deem passive sources of inspiration as less important, but rather emphasize the fact that physical experiences shape us in ways the digital or printed world simply cannot. The gateway drug is not creating art, but experiencing art. Having the whole world explained, or even better turned upside down, just by looking at a few strokes of oil paint on canvas… that’s the greatest thrill I know. 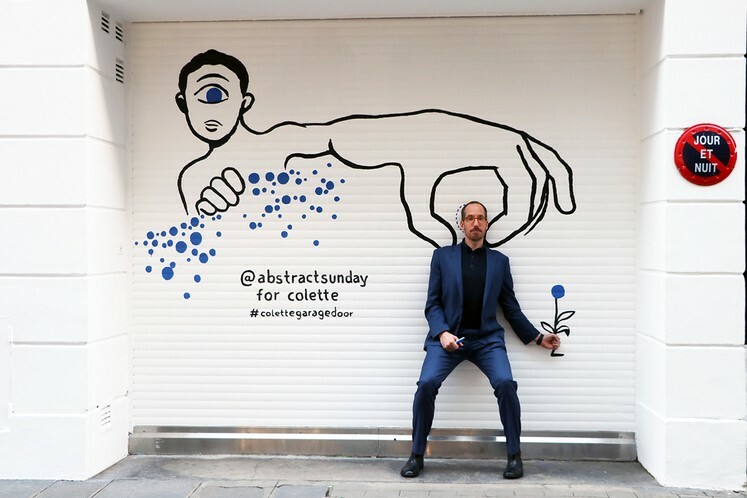 Cristoph Niemann posing with one of his illustrations for French lifestyle brand Colette. So, what does this mean for creatives? Simply put, we need to ensure that we make time to be inspired by experience. As a freelancer, exploring the creative community in which you work is one of the best things you can do for personal growth in your craft. Not only will you learn more about other creatives in the area, there’s a chance of meeting someone new whom could lead to that hot connect, that next big client, or become the catalyst to your greatest source of recognition. As an agency, budgeting time for creatives to venture outside the studio or office only leads to positive consequences. Think of it as a fruitful investment, not as a drain on resources, and reap the rewards of having happier colleagues. The result is unparalleled productivity and increased workplace satisfaction. Employees cannot be expected to produce groundbreaking content without the ability to explore multiple avenues of inspirational intake. Employees that are inspired by the experiences they have outside the office come back refreshed and energized, equipped with more knowledge than before. They can easily share their newfound knowledge with the rest of their team and bring a fresh energy to the production process. So, the next time the opportunity arises, consider the benefits of sending your creative team to that upcoming lunch and learn, design conference, or creative summit, and remember that the time you spend on them will be returned to you ten-fold. While production remains at the center of what we do as creatives and designers, it’s ridiculous to think we can produce great material without adequate motivation. Inspiration can come from many places (including from within), but inspiration that comes from our experiences in the physical world is perhaps the most powerful. As we produce more work and the need to outproduce each other increases, balancing the input against the output becomes all the more critical. Placing a higher focus on the experiences allows us to step back from ourselves and gain a new perspective from others around us every day. Thanks for reading! If you like this story or think that someone else could benefit from it, click the 👏 button and share to spread the word! I’m a Graphic Designer, Design Strategist, and Travel Enthusiast from Raleigh, NC. Learn more about me at benmarkoch.com. I also work with an awesome group of people at Paradigm Innovation. Get in touch with me to learn more about design strategy and design management, or check out our Medium channel, #DareToShift. Have your own thoughts about inspiration by experience or the balance between inspiration and production? Feel free to comment below!